When more invasive diagnostic measures are required to pinpoint the source of seizure activity, implanted EEG electrodes are often necessary. According to Michael Sather, M.D., surgical director, Penn State Hershey Comprehensive Epilepsy Center, two types of implantation are commonly employed: open surgery to place subdural electrodes directly on the surface of the brain, or a less invasive option where depth electrodes are placed in predetermined locations, which require small drill openings. 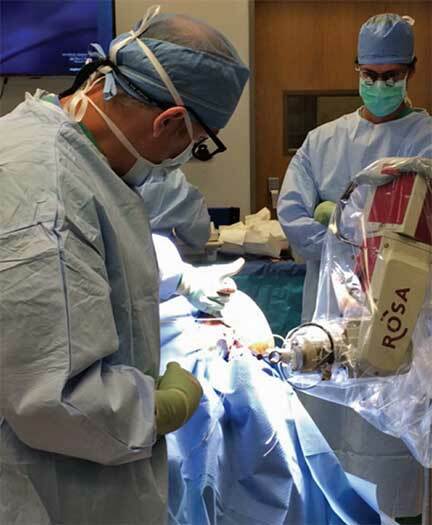 An optimal method is the ROSA™ system, which Sather describes as “a robotic arm that allows us to input a patient’s scan data into its software and then proceed with precise placement of the relevant electrodes.” Both technologies have been recently introduced to the field, with Penn State Hershey Neuroscience Institute being one of the earliest adopters. RESIDENCY: Neurosurgery, University of Nebraska Medical Center, Omaha, Neb. MEDICAL SCHOOL: University of Nebraska College of Medicine, Omaha, Neb. Holmes MD. Dense array EEG: Methodology and new hypothesis on epilepsy syndromes. Epilepsia. March 2008. 49;s3:3–14. Ryynänen ORM, Jari A. K. Hyttinen JAK, Malmivuo JA. Effect of measurement noise and electrode density on the spatial resolution of cortical potential distribution with different resistivity values for the skull. IEEE Transactions on Biomedical Engineering. 53;9:1851-1858.